If the video is not available then the upload has yet to be completed. For those of you who frequently visit my site, I have made the written review available to hold you over until the video has completed its upload. I appreciate all of your continued support! 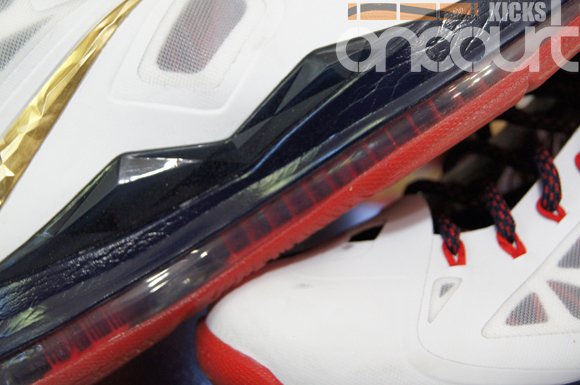 Traction – The traction is the best we’ve had on a LeBron in quite a while. 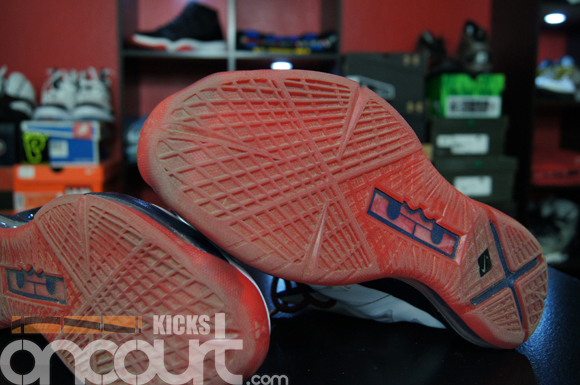 Court coverage is abundant and it’s featured throughout the entire outsole all the way to the edge. From a front to back standpoint you are pretty much covered no matter what… jump stops, jab steps and quick hard stops are solid without slipping or hesitation. Cutting and curling coverage could be a bit better but I’m almost positive that is due to the overall construction. With the cushion setup you aren’t going to receive the most flexible ride so you just have to deal with what you are given. I’m sure that Nike will continue to innovate & expand the new cushion tech to offer wearers more flex in the future so just sit back and wait to see what happens. Cushion – Simply put, it’s insane. Straight beastly! The heel feels just like a regular Air Max 360 unit but once you begin to run & jump you will see where the Zoom Air/ Air Max combo starts to fit into place. It’s almost propelling in the forefoot and is just incredible. There were some minor stability issues along the outrigger – more pillars in that location would have been useful – but overall it’s a great new setup that offers you the best of both worlds. Material – The Fuse is thick yet flexible. Durability isn’t an issue – as we have come to expect. One positive to take away from their larger price tag – $180 for the regular & $290 for the Nike+ version – is that they will last you a while. Break-in time isn’t really required here so that is something most of us will come to appreciate. I remember when they first used Fuse on the LeBron line with the LeBron 8 P.S… this is nothing like that stiff and rigid Fuse, this time around Nike has made the plastic based material feel almost luxurious. Fit – If you have the Hyperdunk 2012 – or have at least tried it on – then that is what you can expect with the LeBron X. They are true to size but pretty snug so if you don’t like to have the upper wrapped around your foot – I personally love it – then you may want to go up ½ size. 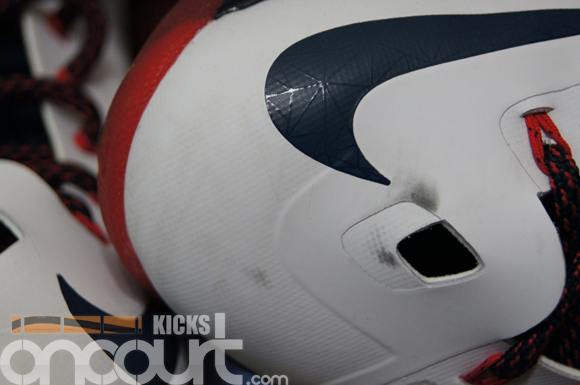 Lockdown is apparent once your foot is inside the shoe… and you won’t even have laced them up before you noticed. From heel to toe, you receive one of the best overall fits any sneaker can provide without chaffing or hotspots, much like the Hyperdunk 2012. The Dynamic Flywire works in tandem with your movements as each set of cables adapts to your game while in motion. Dynamic Flywire really does make the older Flywire seems outdated and it wasn’t introduced that long ago. Ventilation – The ventilation is nice. Above average but nothing to write home about, however, it’s definitely better than the LeBron 9 & LeBron 9 Elite. With the way that most brands are making their hoop shoes – lighter, brighter and more ventilated – you sort of begin to ‘get accustomed’ to the whole air flow thing; so if it isn’t breathable you have something to complain about while if it is breathable then it’s not really a ‘special feature’ any longer. Support – The support is available but not restrictive. You can’t really feel the TPU plate supporting your foot or arch but that is mostly due to the shoes lack of flexibility. It’s the shoes fit that really lends its support to the wearer and that is noticeable and welcomed. As stated above, the only thing I would have liked to have seen is more support columns within the Air unit itself along the outrigger. I think that would have helped the overall stability of the shoe thus offering you a slightly more supportive ride. The AJXI had features we’ve seen before – Phylon midsole & full length Air cushion – but the Phylon was lighter in weight than the previous model – AJX – and offered a softer ride. Then you get to the tech upgrades. Carbon Fiber was introduced to a basketball shoe for the first time, something that is now expected. Patent leather was used for the first time, not just because it was shiny but also because patent leather is a bit more durable than regular leather – if you don’t believe me then play in the Jordan Melo M8 for a while… you’ll thank me later. Ballistic mesh – I’ve heard it called other names but this is what I’m sticking with – was used along the upper… it wrapped around your foot perfectly – just like this new Fuse they are using in the LeBron X – and reduced weight. Lastly, it was the most expensive model in the Air Jordan lineup at the time, retailing for $125. The Air Jordan XI set the standard in 1995 for what we received throughout the rest of the 90’s and most of the early 2000’s as far as basketball performance footwear is concerned. Now we have the LeBron X… this is where Nike is dumping their latest and greatest tech. LeBron’s most recent signature is the most innovative and technical piece of sports equipment the footwear world has ever seen… they’ve just raised the bar and from now on we will see sneakers made that are trying to catch up… just as Nike had done back in 1995 with the Air Jordan XI. Are they worth the extra money for the Nike+ version? I said this during the Hyperdunk 2012 review and I’ll say it again… not unless you are going to become a professional basketball player. The Nike+ system is not useful to the average ball player. Are they worth the $180 price tag that will be on the non-Nike+ version? That’s up to you… Nike is a luxury brand. If you can afford luxury then go for it but if you can’t then you will get by just fine with a $50 pair sneakers found at the Nike outlet or some other discount store… trust me, I have firsthand experience with this and I got by just fine. awesome…cant wait for the video! Is the cushioning better than the micro g featured in the micro g torch? You cant compare foam cushion to air cushion, its not comparable at all. Is air a lot better? Is this the best impact protection on the market? Would the traction have been better if it was solid rubber. It would have been slightly better but flex grooves would have helped more. So will it be included in your top 10 of 2012 list? Yes, I just have to update the list when I have time. Update your top 10 list! Great review! Any news on the Air Jordan 2013? I have the Melo 8’s and LeBron 10 and I have to say….. You were right! great shoe, a little heavy but doesn’t matter, good flexibility, one of the support in the LeBron series, Cushion for me is 11/10 because it’s too perfect! Overall very great shoe and Thank You nightwing! Hope you do the review on the upcoming Kobe Dream Season IV and Nike Air Max Hyperposite! Will wait for the Christmas Colorways! They do feel heavy, esp when compared to other sneakers. Im a small G so anything with extra weight is noticeable for me. Sounds like a great shoe. Too bad it fits like the hyperdunk’s. Oh well. Nightwing always seems to amaze me. Great job with the videos! I was reading a performance review from another sneaker website and it was talking about the amount of responsiveness of a shoes cushioning. While reading this review i became confused about what constitues as responsive. Soo…is plush, soft, and absorbent cushion not as responsive as say a more dense, firm type cushioning system? From what i read, I got the impression that a shoe has to almost sacrifice a certain amount of cushion to remain responsive. Thanks for your time! Going barefoot would be the most responsive so it’s dumb to focus on response rate in shoes. They will naturally slow down your response rate. The key is that they shouldn’t noticeably slow you down. Responsiveness seems to differ from person to person. I have two ways of thinking when it comes to responsiveness. The first is the minimalist feel, the more you can feel something to better and quicker you will respond to it. The other would be Newton’s Law – for every action there is always an equal and opposite reaction. So with the pressure applied to this Max Zoom unit the more energy return and force is given back to the wearer thus the propelling feeling it brings. This isn’t quite right – total energy return is identical in any form of cushion so long as it resumes its original shape. What you’re referring to is a cushion that restores its shape more quickly. A firm unit will absorb and return the same amount of energy as a softer one but in a shorter amount of time – therefore exerting more force. I disagree. A brick resumes its original shape… does that offer the same amount of cushion as an Air bag? A bounce house is a single shape or form that has air flowing consistently yet depending on the force you apply you will bounce higher or lower into the air. If every cushion system absorbed the same amount of energy no matter how dense it is then all of these company’s would be wasting their time and lying directly to your face even though science proves each cushion has different properties and capabilities. This is why I don’t necessarily agree with a stand alone score for “cushion”. What constitutes 10/10 cushioning for one player might be a 1/10 for another depending on needs, stature and playing style. Cushioning systems as I see them provide benefits in 3 areas, being court feel, impact protection and responsiveness. There are always trade-offs between the three and it’s really up to each consumer to understand what their needs/preferences are. Fortunately, NW goes into that level of detail in his reviews, but its not always apparent if only looking at the overall score. My favorite part of the video was your shooting display at the end. Also, two thumbs up for ending on the shot from behind the backboard. That’s my go to shot in HORSE. Great review overall. I’ll be sure to link to it on my site. I’m pretty much sure that the 180$ version will be the same performance as this less the Nike+ Sports pack. The shoe is almost perfect, so I will cope the 180$ version because I’m just a normal ball’er. Thank you nightwing for reviewing this shoes. They will perform the same just one will have tech that you will hardly ever use. Its a 2012 release so its for this year. I just need to update the list. What category scores were affected on the instability issue on the outrigger? and the issue on the lack of flex grooves and support pillars on the forefoot? Support category? Support, but the flex isnt applied to the scores bc that is a personal preference for most. I was just letting ppl know that the flex wasnt all there and larger players may not be effected by it just like the LeBron 9. 1. Bulky look. Too gerenic for a top signature shoe, looks similar to hyperfuse. 2. Jason Petrie designed these. NW great review. Thanks for being the first to make a review on this. Please also check the weight displayed. thanks! hey nightwing i have a concern about the over all ankle support of the shoe. Im the point guard for my highschool team and i have had alot of ankle issues in the past rolling my ankle spraining it and braking it out out its socket multiple times i do wear a brace now, but does this shoe have good over ankle support that can help me prevent these injuries. Love the shoot around at the end. You gotta hire a camera man to film the shoes up close while playing. So, would you pick these over the Hyperdunk 2012? They will be just fine. The arch is molded and other shoes like the Hyperfuse did have a support bar you just couldnt see it. What I meant by carbon fiber was expected is just that most consumers expect to have carbon fiber in place at the midfoot, its normal now and not a luxury item. It would be cool if it ever happens. Love ur reviews NW big fan one thing is that u gave the Ventilation on these a 9.5/10 I use 2 have the fly wade 2 first one and u gave them a 8.5/10 why is that? These have more points of air flow & ventilation. Larger openings & more of them. You can feel the temp difference when outdoors with a moist foot. wade 2 regulars had a mesh 3/4 bootie. restricts somehow the air flow but pretty much one of the most well ventilated shoes in the market. the x just have a mesh tongue but no bootie with does not restrict any air flow asied from the thin mesh windows for cover. They both have a partial inner sleeve. The tongue on the Wade 2 offers more ventilation than the LeBron X but the side panels and heel of the LeBron X are greater than the Wade 2. I have both shoes, I personally prefer the Wade 2 but I cant be biased when making a review. So which shoe is better for a point/shooting guard the lebron10 the Nike soldier zoom6 or the drose3???? definitely the d rose3… the lebrons are too heavy and i just personally like the d rose3 more than the soldier 6 as a point guard shoe. plus the soldiers don’t have a lot of ankle support. How’s the cushioning compared to the m8. lebrons is a lot better. Great review as always! Can’t wait for this to release here in the Philippines! Thanks NW! There are no ties here. When a shoes have the same score then i go off my personal opinion as to which is placed ahead. I wanted to put the HD first bc i like playing in those more bc of my style of play but i felt the lebron was more innovative overall. You may want lunarlon, its more stable than the others you mentioned. Do u think that the Air Jordan 2013 will be better than the Nike Lebron X? How do you compare these shoes to the lebron Elites and the Hyperdunk 2012? I know you just because the shoe is rated higher, doesnt necessarily mean you like the shoe more. Hey! I really have a hard time choosing between the Hyperdunk 2012 and the Lebron X. Can you give me a suggestion? I usually play outdoors. I also have an issue with my ankle and I’m afraid that I might sprain it. Thank you and I’m waiting for your reply. Another great review NW. I’m excited to try these out based on your review. I’m still struggling with the looks of the shoe. They are just so bulky looking and I haven’t liked many of the colorways that we’ve seen pics of to date. Hopefully I can get a pair on discount and the performance will help me forget the looks. Also, do you like playing in these better than the 9 Elites or Soldier 6s? hey nightwing i want to get one of these but since thet have the same score i do not know which one is better?. Does the Zoom Max have a bouncy/responsiveness feel to them? Like The Flightposite 3’s Zoom air responsiveness? Your friend should be figuring out a way to earn some money in order to afford a decent pair of kicks instead of eyeing something that he/she cant afford. Nothing is free in life, everything must be earned. Where did you buy the LeBron X when it’s releasing on 9/29? I want new LeBron’s since I’m wearing the 8’s currently (Great shoes but it’s kind of loose fitting.) Any specifications for Colorways being released? Maybe there should be a stability category. These might score low on that scale. They could have used a wider base. That is intertwined with support…I guess. is there still space in the arch? im flat footed by the way… thanks nightwing and nice review! Hey Nightwing, another great review, thanks! Just wondering, the weight listed here is 16.9 ounces , and I currently have the Kobe 7’s System Supreme which have been awesome this year but I’m definitely going to need a new shoe by Christmas because my traction is just dying. I’ve been considering either these Lebron X’s, and the Lebron 9 Elites preferably, my last choices would be the Zoom Soldier 6 or AJ 2012 if I both Lebron shoes turn out to be too bulky or inflexible and heavy to me, as I’ve become used to the Kobe’s which are only around 12-13 ounces, and the Lebron 9 Elites are 15.2 oz, whereas these are much higher at 16.9 ( Did you put the Nike + technology in that could’ve weighed it more?). From my opinion the cushioning on both the 9 Elites and the 10’s seem fantastic, just that the 9 had combo cushioning with Air Max in the heel, Cushlon(which i love on the Kobe 7’s) in the mid and Zoom in the forefoot, whereas these have just a full length Zoom Max unit which, from your video seem insanely bouncy. Which would you recommend to a quick guard? As i said, I’m worried about the weight and the amount of flexibility the Lebron shoes offer, its a pity I can’t try them out because my country has almost zero availability for the latest Nike’s, as Nike Elite shoes aren’t even available here and the Lebron 10 isn’t gonna be here until Nov/Christmas, where I’m going abroad for a vacation where I can get some new kicks. Sorry for the really long message, keep up the awesome reviews man, thanks! P.S Does the carbon fiber really make a difference in stability and lockdown, from your standpoint? It seems that its almost a norm with all the models here, with all the shanks made of either glass/carbon or just carbon as with the Elite series. Is it just an overhyped gimmick? Even with the Kevlar Flywire they put in the Elite’s. i really need a new pair of basketball shoes what is good under 120 dollars (size 7)? I played in my XX3 again recently and love that cushioning setup. Can you compare how the Lebron Xs compare to the XX3s? 11.5 would be good and hopefully they break in enough for you. Unfortunately I have a very flat foot and I am a size 11 on my hyperenforcer I have a size 11 and they are very stretched out from the medial side of the shoe becouse of my flat foot and it looks terrible. I went a full size up on my soldier 6 so then it wouldnt be stretched out and it worked a bit. I did this so people wont ask me whats wrong with your foot. I want to ask if you recomend me do this or if going a full size up affects the full performance of the shoe? Hi Nightwing2303, great review as always – I just had a quick question about fit. I haven’t tried the Hyperdunk 2012s but I found the Nike Lebron 9 PS Elites in size 9 to be slightly tight; even though there is enough space in the toe box, the inner sleeve makes it feel quite cramped and uncomfortable which is unusual as I have quite narrow feet. Do the lebron x’s feel similar? The hyperfuse looks a lot more flexible wheres on the 9s they were pretty molded and solid so I hope they are more comfortable. The Fuse is more flexible than the 9 but the fit is pretty snug width wise. Thanks for the quick reply. I managed to order a pair and then tried on the Hyperdunk 2012 and if it’s the same I’m more than happy as the hyperdunks feel great. Fit in the Hyperdunk is perfect and way more comfortable than the lebron 9s. I tried on the USA colour way in the hyperdunks which also replaces the clear soles which avoids the dust problem. Might have to eventually get a pair of them. Hey great review! 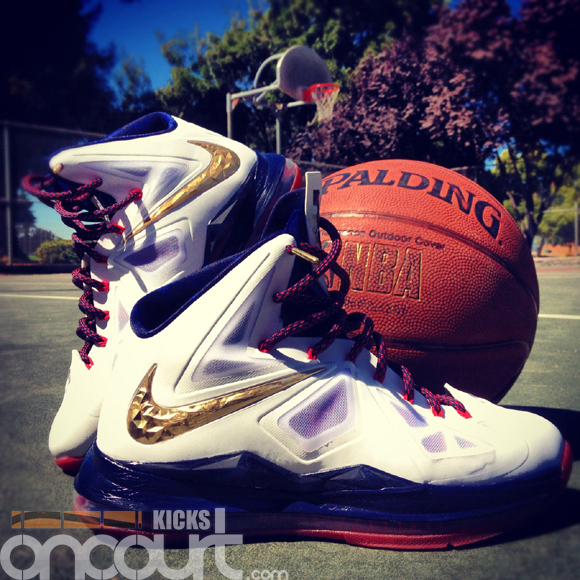 Just wondering if you noticed if the gold paint chipped off of the nike swoosh like they did in the lebron 9 elite. I found after my second time wearing the 9 elites they starting chipping right away. Hopefully nike found away to keep that gold on. Hey thanks for the reviews. I have a huge dilemma on which shoe to get. Should i get the Lebron X, Lebron Zoom Soldier 6, hyperdunk 2012, or hyperdunk 2011? I just play reguarly and if anything I’ll consider myself a small/power forward. What do you suggest? Your shooting form is awful. If you’re a small guard, you need to get more jump on your jump shot. You’re jumping about 2 inches off the ground when you shoot. There is much more involved than athletic ability when shooting as a smaller player. I was professionally trained to shoot and im very accurate. When youre small you dont have the strength to launch the ball as far thus using the energy from my legs to guide the ball to the rim is what was needed. Ive trained with brooms and so on for arch. Ive gone up against huge players without an issue. You need brains to play this game so please keep your negativity to yourself. By the way I love yor shooting stance iv tried that so many time but it does not work and my stance already is weird. By the way I’m a shooting guard and I need great ankle support and Cushing what shoes would you prefer. Tried on the Blue Diamond colorway today. The cushioning in these is amazing and fit is very good. Unfortunately the cushioning makes the midsole SUPER thick. I felt like I was walking on platform shoes and they did not feel stable. I really wanted to get a pair of the Xs, but I’m going to pass. I’ll pick up some IX Elites instead for less money and the styling on those is WAY better. They’re called the lbj soldiers….. The description I’m listing is for on court use of my shoes. I first started experiencing knee issues because the 2008 Hyperdunk I was wearing had no cushioning. The Fly Wade 1’s were next and had good cushioning but my foot started to hurt because they were very narrow. I then bought the Jordan 2012 Wolf Grey pack from advise from this sight and I bought them online without trying them on, and for me they were the worst out of all I listed because even with thick Elite socks, normal and double, these just tore up my toes with very deep cut and I could feel the harsh material of booties and the ankle support was akward. I then went to try on the Zoom Solider 6 and bought them because of your review. These shoes are true to size, light, have great cushioning & traction. My foot pain was coming from the pinky toe area which is now gone but they have a weird like curvature that you mention in your video by the toe that gives me bad blisters and I also get a kind of a weird off balance feel when I’m driving hard to the lane pushing in that certain toe direction. If not for the bad blistering, these would be my personal favorite shoes of all time, over the Huarache 2K4. My question is, are the Lebron 9 Elite the next step up, and could that fix my Solider 6 issue because they are so similar and they don’t have the curvature? I’ve been waiting for the 10’s but you say these are as narrow as the new Hyperdunks upper but how about lower? Because the side of my feet feels like it’s coming out of those and resting on the sides, kind of like the D Rose’s. What is the weight of the 10, can’t seem to find it? Aye the LBJ 10’s are 16+ ounces in a Size9..
/\ If I could get a quick answer on that, it would be great because they are at outlets now. Also some colorways of the 10’s are coming out in a few days that I like but if they are narrow then I’m going to pass. I would send a private message but I can’t see that as an option. Would this sneaker be a good option for outdoor play. Would this shoe be good for a small forward? Would you recommend these or the adidas rose 2.5’s for a fast paced guard? Or would you suggest a different sneaker? Hey Nightwing2303, I am wanting to buy the Lebron X’s for my upcoming basketball season. I am a small forward/point gaurd, would these type of shoes be a good buy? I’m planning on getting customized ones to play in for my last two years of highschool. I would really appreciate it if you could reply as quickly as possible. Thank you, your review also helped a lot! Yo nightwing awsome review!!!!! Im having a hard time choosing between the lebron x and the hperdunk 2012. Im a outdoor player and i see that you chose solid rubber than the xdr outdoor rubber, does it work well In the hyperdunks? If you need a shoe for crossovers or you need a light weight but supportive shoe and can handle your foot anytime then you need the Rose 3. If you like a shoe that is light and fits your foot better with a comfortable insole inside then you need the soldier six if you want heavy not so supportive but helps you jump higher and it fits like hyperdunks then you need lebron X. So which shoe ( PG and SG ) lebron10, the nike soldier zoom6, or the drose3?!?!? the air max or is it just usual zoom air that makes your knee tired after couple games? I need some help!!! I cant decide whether to buy the lebron x or the hypurdunk 2012!! I play as a point guard and im pretty quick!!! I wanted to know which one would you recommend and far as not slipping, rolling of ankle, and long lasting?? I was at HOH today and wanted the pressure ones. They felt great but i was a little concerned about the clear sole on the gym flour. Do you think it would provide solid, good traction on a somewhat dusty flour? Great reviews bro they help a ton! Keep it up! Why did u take of the lace lock? Is it supposed to come off for performance? I tried em on at my local footlocker, i was about to buy it and i remembered you saying the support around the outrigger. I really felt that lack of support and with it being a high off the ground (compared to a HD12) it made me wonder if it would cause a huge issue in terms of rolling your ankle. I know you wouldn’t know my style of play ( i play forward), but in your perspective or experience did you feel that this might happen seeing as your a guard and uses a full range of direction. Any thoughts would be much appreciated. Thank you for all your reviews, I’m a huge fan. Are the lebron x as narrow as previous lebrons? example the lebron 8’s. Nightwing above all other persons who does performance review on diferent shoeson their websites everything you said from cushion fit on material ventilationsupport was true. Good job man, and have to commend nice shooting touch too. but i’m not a post player. but somehow i felt that when i wore the HD 2011 i felt i’m a little bit more athletic, jump higher and cut faster. so i wonder how this 360 ZOOM air feel in real life ? do they feel like zoom or air max ? will i rolled my ankle in theese ? if i cut hard to that sections ? cause what i loved from HD 2011 is that “large” out tigger and i swear it helps me couple of times from rolling my ankle. 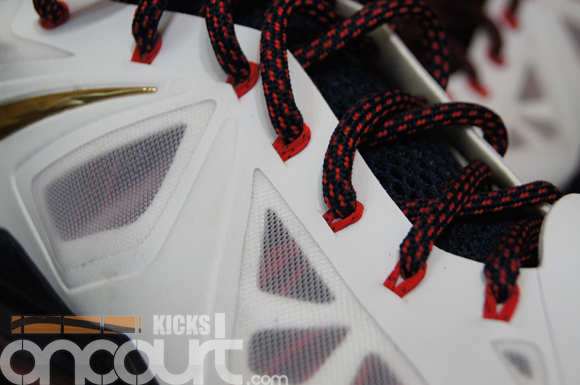 do the lebron 10s hav an independent fit harness like the 9s and 9 elites do? im a powerfoward, and i play fast, people consider me fast for a power foward, and so i like to play fast, i can shoot, and rebound, and i really like a shoe that is very versatile. So right now, i’m using kd 4s as my main shoe for playing, because its light, has good lockdown, and allows me to have full range of motion when i’m speeding down the court. Whereas my lebron 9s, don’t allow the same amount of versatility. I was wondering if the lebron 10s would be right for me, lightweight, explosive, etc, just like the kd 4s. If not, is there another shoe you can reccomend for me? Hey nightwing great job with these reviews, I need your wisdom. I’m about to buy the Lebron 10, I love the air max 360 soles, are this the best air soles shoes I can buy? and where can I get the best price? I need to buy them online, but I’m trying to get the real thing, there are a lot of fakes in the market, in nike.com I can get them for $200 but thanks for the advise. Its just a large version of Zoom Air. Very good cushion IMO. They are still available on Eastbay and FinishLine websites so they shouldnt be hard to find. Hey NW, would you say that the cushion on these are easy on the joints than foams or not? Hey Nightwing, I love all your performance reviews! So how would compare these to the Melo M8’s cushion wise? Would you say Lebron X would be the better choice out of them? Hey Nightwing! thanks for your awesome reviews! btw, what shoe would you prefer for a heel striker like me? thanks! Hey! Around how heavy is the Lebron 10? are the lebron 10s good for a guard? i’m just trying to give an inputs if you are ok with it. and i don’t buy them for the look. i bought them cause i want a good performance basketball shoes. i’m finesse type of player that don’t use my strenght much. I will try to do reverse lay up than to do post up moves. so basically my game is outside and slashing, without too much of post game. but i post up a lot when i defend, rebounding and all. anyway i just bought the lebron X cause i’m curious of the cushioning in these. a little bit of my shoes history, i played since i was small, so i do have a lots of basketball shoes before. Nike Shock VC III, Air Jordan VIII, Nike air Go LWP, Air ZOOM ’95. currentlly i ball twice a week with my team , we are not pro, we just play scrimmage and play casually. the X fit nicely it hugs the foot well i’ve no problem with it. compared to hyper dunk 2011, i prefer the fit and comfort of the lebron X.
i’m 101% agree to what night wing said, this cushioning on the X is totally awesome. because they are to “light” for the shox to be effective, i think with my weight it does make the system works better. the LeBron X while it’s a little bt to “soft” to my liking, its give my kind of strange “spring” sensation especially in the forefoot. you can’t actually feel this when you standing up, but try to run and jump with the shoes and you will understand what i’m talking about. just for info, in the first 3 wearings, i have a pain on my feet palm when wearing leborn X , maybe i’m not used to full length air cushioning, but after that and also i did loosen the lace a little bit, now i feel comfortable with it. the weight in lebron X is actually not that bad, the only other lebron shoes that i had is the VI and that’s was very heavy. but still ompared to hyper dunk 2011 this lebron X feel heavy. i feel that i”m more sluggish on the court when wearing it. maybe because of the weight and also because the high cut and the ankle support in this lebron X is very stiff. and actually they should make the outrigger a little bit bigger too. the traction is good, i don’t have any slippage so far but is still prefer that old school herringbone of the hyper dunk 2011 , i played in indoor wooden court . i love the sketching sound it gives me more confidence when i cut harder. but like i said this lebron X doesn’t produced the sound but the tractions it self is not bad. i’ve started to feel a pain in my knees after playing ball. i guess i need more supportive and cushioned shoes to minimise this. but since i switch from hyper dunk 2011 to this lebron X i feel less pain in my knees and back. well the shoes is not perfect though. i still proffered it to be lower to the ground and lighter but i guess nothing is perfect. i still don’t know why that i feel that i played more sluggish when i wore them. i felt that i can’t jump higher and can’t run faster with these. maybe its just the mind playing trick on my but that’s what i feel. i really recommend this shoes for people that have knee pain and back pain after playing ball. and also those who on the heavy side of the scale. pardon my for my bad english. Would you recommend this shoe to Point Guards? As for quickness and support. Maybe you have wide feet. I have both and they both fit me exactly the same. Love these! Anyway, are these good for outdoor and how do i clean these? Thanks for the review Nightwing. I exchanged a pair of the new Hyperdunks for the LBJ X Carbons the other day since the they were hurting my feet. I wore these at my gym for the first time last night, and I love the support and comfort while playing in this shoe. There was minimal break-in as you reviewed. I’m also still getting used to the higher ride from the full length Zoom air bed compared to playing in my LBJ9 PS Elites for the past 6-7 months. This shoe basically feels like a souped up LBJ 8 shoe so far in all categories. Really impressed that the LBJ shoe line continues to work well with my custom orthotics unlike the Hyperdunks. Thanks for the review. But I’m trying to decide which lebron shoe I should buy since this would be my first pair of lebrons. I was thinking about the lebron 9 elite series or these lebrons, but I’m not sure these would suit me since I’m 5’11/ weigh 150 and I play more of a point guard or shooting guard. My last shoe was the adizero rose 2.5. But I just need your opinion if these shoes would be right for me, and when the gold fades on the Nike swoosh can you tell a big difference or can you barely notice it when the shoe gets some ware on the elite series. Thanks for the time and keep doing your thing man! And I heard that the elite series Nike swoosh chips and peel, and I didn’t know if this was true? Through standard court play, yes they’ll peel over time as people step on your feet and incidental contact occurs. I can post a pic of mine after 6-7 months of play to give you an idea of what they’ll look like over time. 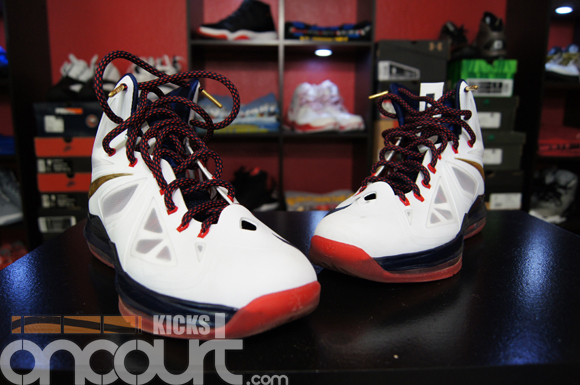 Was writing about the PS Elites here btw, not the LBJ X olympic shoe. When I read gold swoosh, I immediately though PS Elite, my apologies for the confusion. I was talking about the elite series to, and a picture would help to get a idea about it. And I need to know if these shoes would be right for me. Hey Garret, I just got around to looking at this comment now. I got rid of my Elites not too long ago after moving to the X and picking up a pair of CP3.VI’s to back them up. You’ll notice gold chipping fairly quickly depending on how much people like to step on your feet or through incidental foot contact, if you don’t mind the chipping it’s a fantastic performance shoe. Upon the last month I was wearing these, I was getting tears in the upper right hand side of the fuse on both shoes, basically where my forefoot flexes the most. It didn’t jeopardize any performance, but just something to note. I’d also like to note that the traction was still fantastic after 7 months of playing 3-5 days a week for 2-4 hours. The cushioning was also beginning to break down as my knees and lower back started getting more sore after playing. Keep in mind that I did not rotate these with any other shoes for hoops during that time frame, so they experienced some high mileage on them but certainly lasted well. I still can’t decide whether or not I like the X or 9 Elite on the court more than one another to be honest. I love the support, and full air zoom ride going up and down the court with the X, but also miss the heel and forefoot air+ zoom combo cushion setup with cushlon in the 9 Elite. Most of all I miss the pro combat bootie in the 9 Elite, but the X is a pleasure to play in as well in terms of comfort and performance. I don’t think you can lose with either of these shoes. I’d say if you want better court feel, go with the 9 Elites, if you want more comfort, go with the X’s. I also sort of regret not giving the KDV a fair shake, so maybe that could be an option for you as well. just wan to ask you guys about the translucent its is good for outdoor ? I’m getting these for Christmas, can one jump higher with them? so i need a second opinion here, thank you. Will these shoes last when you play with them outdoor? How did these perform on a dirty court as opposed to a clean one? Is this shoe better overall than the Melo M9 ? Because I’m a 2guard and I like a shoe with great support but not to heavy like Adi Power would be? just wondering how the rubber is on these. im wondering whether i should get them because i need them to last a long time, especially with traction, both on indoor and outdoor courts. keep up the great work! Hey NW I love your site and reviews! I was in need of a new pair of bball shoes and found your site – now I’m addicted! I used your reviews and opinions to help me find my perfect shoe, which I’m sure is what makes you happy at the end of the day. It really is important to do your homework when you’re considering spending a few hundred dollars on shoes! I ended up going with the Lebron X, and I must say they’re the most amazing shoes I’ve ever owned. I’m a bigger guy, so I decided the additional cushioning (which IS as amazing as you described) was worth the extra ounces and a little less flexibility in the shoe. I went up a half a size, so for all of you that really don’t like a super-snug fit like NW (I felt my normal size was too tight on my toes), I would buy a half a size larger than normal. Again – big thanks to you, NW, for all of your reviews and for helping me find the perfect kicks. Keep up the good work! *PS – you should review the APL Concept 1 or 2, I know they claim an improved vertical, but I’m just curious as to how the rest of the shoe compares to the big name brands. Is there a difference between the translucent or solid when it comes to wear and tear outside ? Can i ask if this shoe would fit for wide feet? i dont have massively wide feet but im just wondering. hey guys.. can you help me with my nike lebron 10 prism.. theres a leak on it.. can this be fix? theres a wire prick on the side of the airsole of my lebron 10.. how to fix it? getting the floridian CW this weekend… cant wait! Nightwing I need serious help! I’m a 5 8″ freshman point guard and I need to choose between the Lebron 10, Kobe8, or the KD 5. I’m leaning towards the KD V because I can customize them for the same price as the Kobe 8’s but for a guard of my height which is better? Hey nightwing which shoe do you think is more durable, this or the hyperposite. Should I take the lace lock off my LeBron X+. You took off yours and I am just wondering if you think it affects the performance of the shoe? It does seem to limit traction, but does it make a big difference, yes or no? I just bought a pair of these LeBron X shoes and a pair of Soldier 6 shoes online, and IMO the Soldiers are a much better shoe. They’re super comfortable and have great ‘court-feel’, they’re very light, and have amazing traction. I played in them (indoor) the other night and couldn’t believe how big of a difference they made in my game compared to the Reebok ZigSlash shoes I’ve been using. I always thought I was slow laterally, turns out I just had zero traction. Anyway, the Lebron X just felt like a heavy, bulky platform shoe to me. I tried on a pair of Sketchers Shape-ups once, and that’s exactly what the Lebron X felt like. They’re very cushion-y, but they’re super high off the ground, it feels silly. I knew immediately I wanted to return them, so I never played in them, but I can imagine myself easily rolling an ankle. Anyway, that’s my take. I’m a 5’11” SF that does a lot of slashing and some posting up and likes to get out and run the fast break. The Soldier VI is my new basketball shoe, I love it. will the traction be durable enough for outside? Hi Nightwing, I´m a 5’8″ PG that likes to a lot of crossovers and to sprint a lot … and i really dont know what shoe should i buy , between Lebron X or the Kobe 8 . I had already experimented both but I dont know what should i buy . just wondering how do you experiment with these shoes without buying them? I just want to let you know that I really enjoy reading your reviews. This year I purchased the Kobe 8, DRose 3.0, Hyperdunk 2012 and Lebron X and all your reviews were spot on, I mean to the “T.” I look forward to continue reading in the future for all my bball kicks information! Hey nightwing I wanted t ask you if wearing the lebron 10s will you feel a burning sensation on the arch of your foot if you have narrow feet? 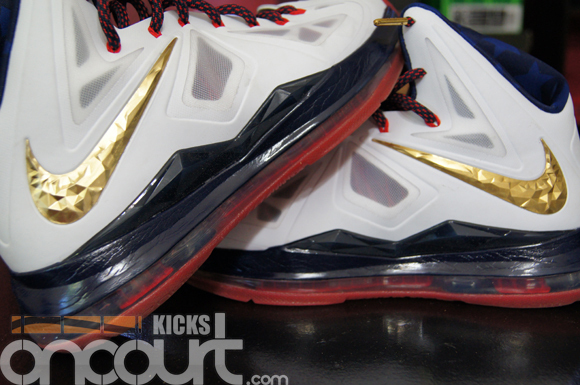 I have worn lebrons for a while and I would feel pain wearing these on the arch. I havent personally but it sounds like the lack of flexibility is causing discomfort for your arch. is this the best Zoom Air Experience ever? hey nightwing was wondering in terms or outdoor durability which traction would last longer the hyperdunk 2013 or lebron 10 low. Reason being is that i need new outdoor kicks and both these shoes are on sale. Hi, I bought 2 pairs of LebronX, one for my son the other my daughter. Both play travel ball n practice 3-4 times a week along with tournaments on the weekends. The mesh on the sides, the black and gold Nike swish is coming off, and one has a hole in the air. Is this normal??? Hey! I play outside most of the time. Will these work for me? Lebron 10 Cushing has 360 air max technology is there another fusion? Would the Nike+ version be bulkier then the standard one?